Is there a better combination than yoga, mimosa’s and shopping… I think not! Join us for a free yoga session instructed by an amazing local instructor sponsored by RedZone Realty Group followed by complimentary mimosa’s and an exclusive shopping experience where you’ll receive 10% off your total purchase. 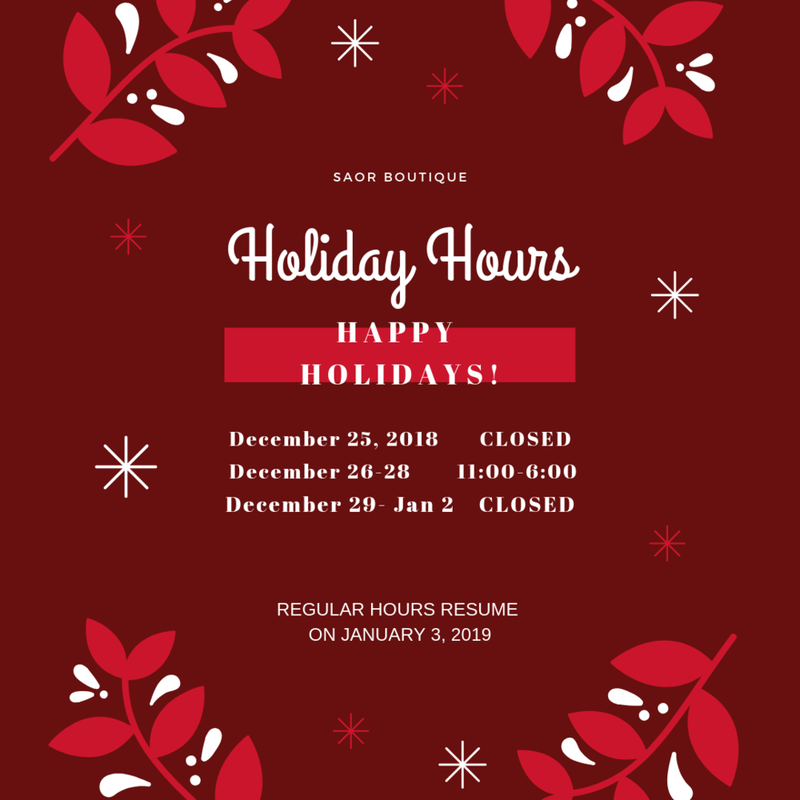 From France to SAOR Boutique. 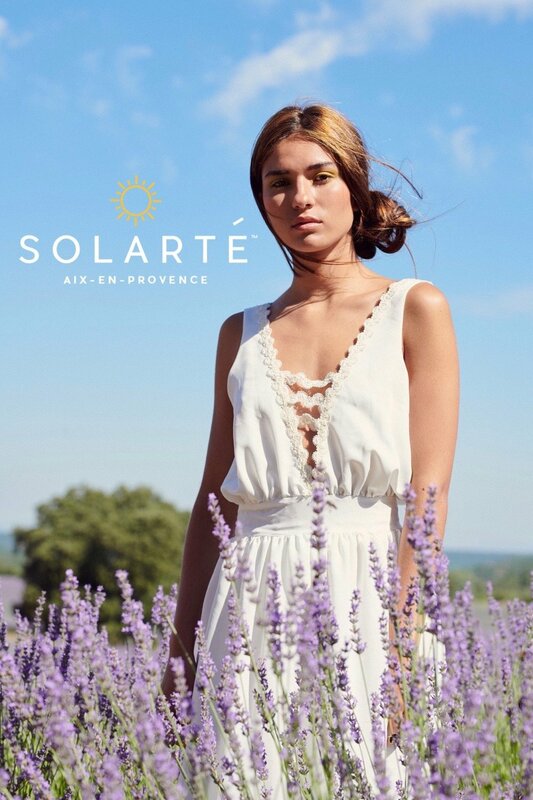 Stop by to shop and sip while testing the ultra luxurious products by Solarte AIX-EN-PROVENCE . Solarte's mission to empower all women to live their lives boldly, confidently, and without fear. We are especially committed to women who are working to overcome adverse relationships and life circumstances. To do so we provide products and financial support to safe houses for women all over the country. 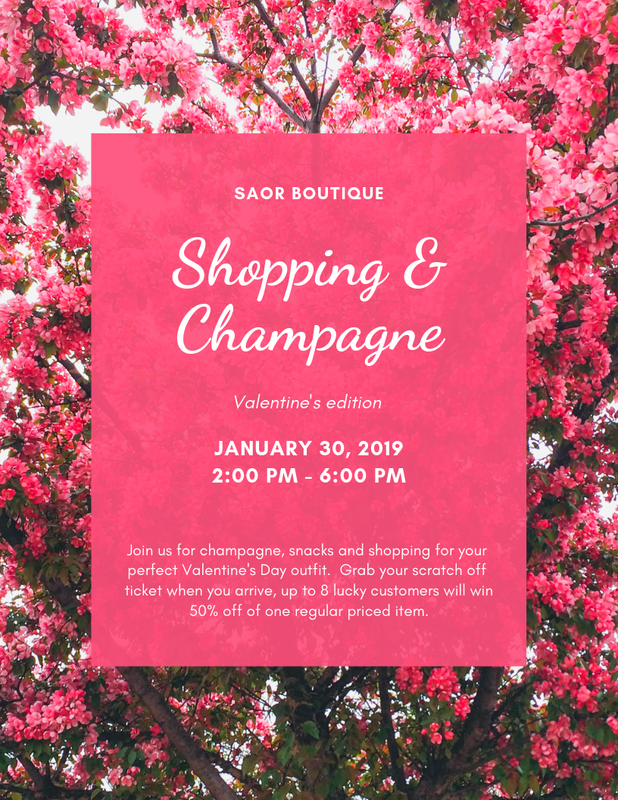 JOIN US JANUARY 30TH FROM 2-6 PM FOR SHOPPING, CHAMPAGNE, TREATS, DISCOUNTS AND COMPLEMENTARY FOOT SCANNING BY VERTE CHIROPRACTIC. GRAB YOUR SCRATCH OFF TICKET WHEN YOU ARRIVE AND UP TO 8 LUCKY WINNERS WILL RECEIVE 50% OFF OF ONE ITEM OF THEIR CHOICE. Come find that perfect NYE outfit. 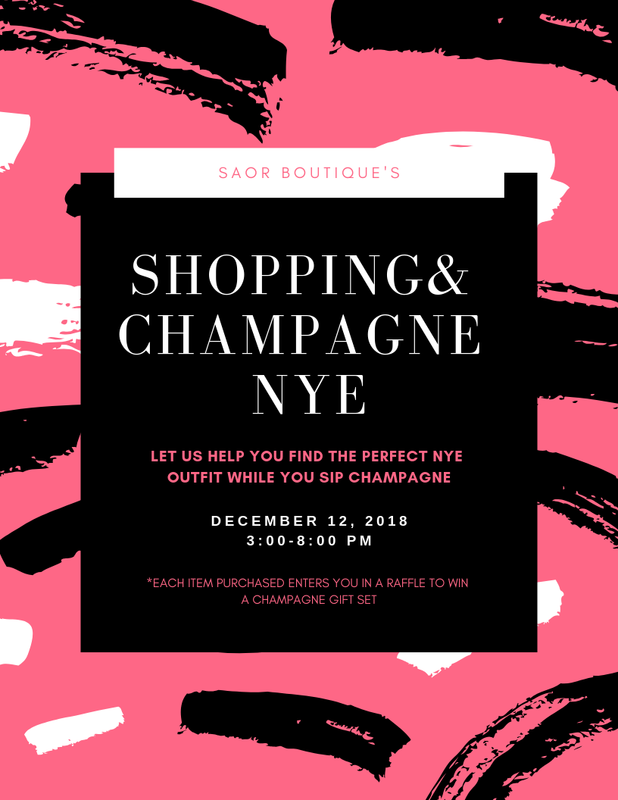 JOIN US DECEMBER 12TH FROM 3:00-8:00 PM TO SHOP FOR YOUR PERFECT NYE OUTFIT WHILE SIPPING CHAMPAGNE WITH YOUR GIRLFRIENDS! TO HELP COMPLETE YOUR NYE LOOK LARK & LEMONS WILL BE ONSITE TO HELP YOU FIND THE PERFECT EARRING TO MATCH. WE WILL BE OPEN LATE JUST FOR THIS EVENT. *EACH ITEM PURCHASED ENTERS YOU FOR A CHANCE TO WIN A CHAMPAGNE GIFT SET. 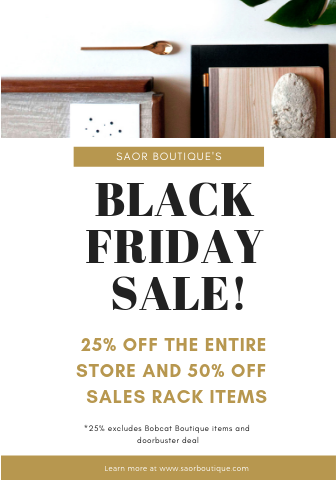 Come join us for our first ever Black Friday sale!! We will be offering amazing doorbuster deals, 25% off of the entire store and a 50% off sales rack. One day only… this is a sale you won’t want to miss out on. *25% off excludes Bobcat Boutique items and doorbuster deals. We have been open 1 month and truly feel the love. We appreciate all of your kind words, great feedback and amazing support. We are happy and pleased to be in Baldwin Park and to be at your service. Come in, take a peek and find something unique. 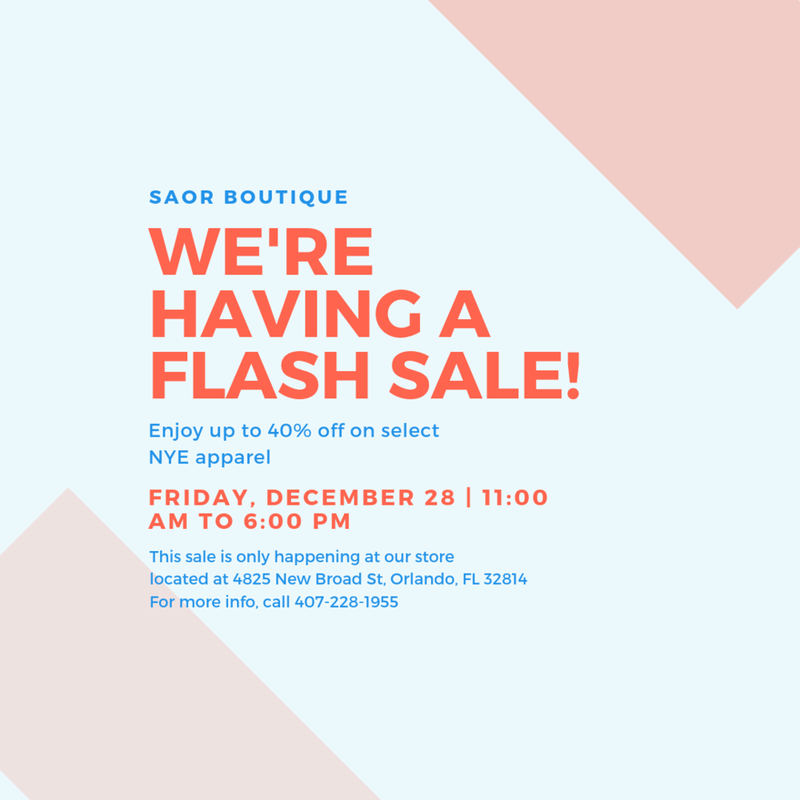 We are getting so close to the opening of Saor Boutique. I CAN'T WAIT!! 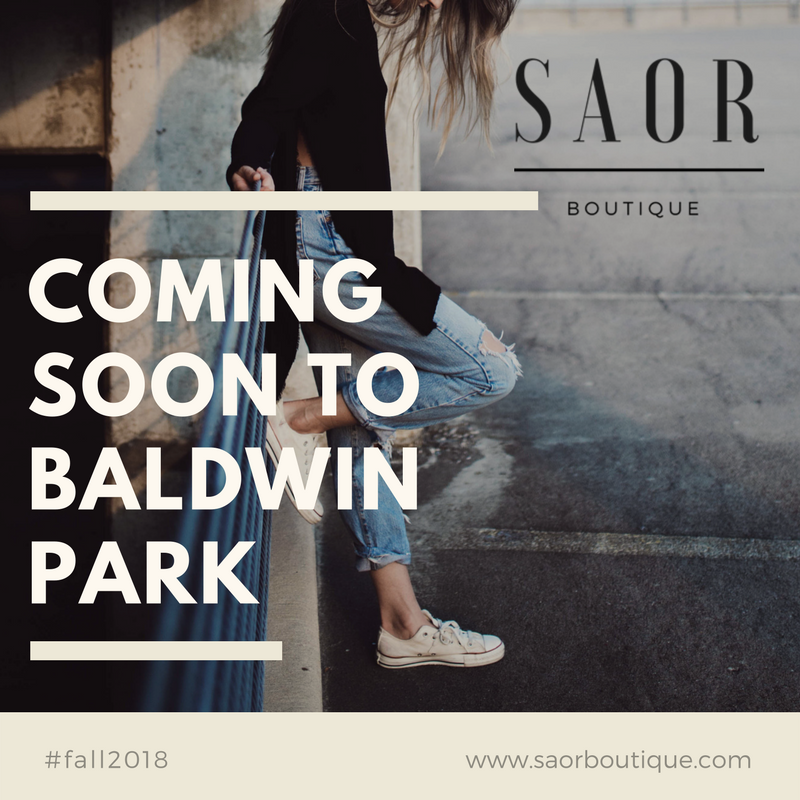 We are so happy to announce Saor Boutique will be the official vendor for Baldwin Park Elementary's brand new Bobcat Boutique!!! WHOO HOO! We can't wait to share all of the fun products we have for our little bobcat's this school year.